I know you’ve all heard of it by now. 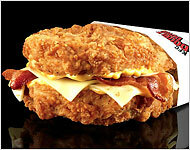 KFC’s grosser than gross bunless sandwich. Here’s a great review by NY Times restaurant critic Sam Sifton. Entry filed under: In The News, Products. Tags: Double Down.